The National Ocean Service (NOS) and the National Weather Service (NWS) have released The National Strategy for a Sustained Network of Coastal Moorings. The Strategy is the result of a focused effort by NOAA and nonfederal partners to define a framework for the planning and implementation of a sustained network of coastal moorings in U.S. waters. Coastal moorings are a vital and versatile ocean observing platform. 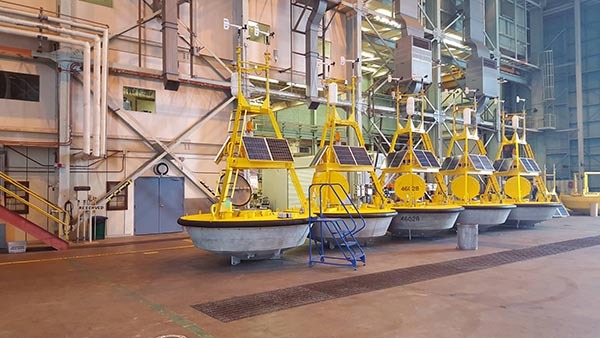 Whether it’s a buoy or an instrument cluster suspended below the surface, the instruments and sensors deployed on these platforms can gather a wide range of ocean information customized to network and user requirements. They are also capable of providing long-term time-series, which is key to monitoring the health of the ocean and Great Lakes. With this Strategy, NOAA has taken the first step in ensuring that these moorings are operated and maintained where they are needed while developing an infrastructure that will allow for uninterrupted deployments. NOAA, as well as their federal and nonfederal partners, had been responding to several incidents of community outcry when project buoys (NDBC buoys funded by NWS partners) lost funding and/or were removed from the water. The buoys had been operated for a specific projects and purposes, and when those projects concluded or the funding lapsed, there was no additional resource to maintain them. The losses created gaps in local observing networks (and the national system) and risked negatively impacting coastal and emergency managers, fisheries, maritime businesses, tourism, and researchers who count on that information to work safely with and around the water. As these incidents continued to arise, the need to establish a sustained network of coastal moorings became clear and NOAA responded. The long-range vision is of a core network of federal and nonfederal moorings, integrated with other environmental observing systems, that will contribute to improvement of resource management, safety of life, protection of property, enhancement of the economy, and scientific understanding of the coastal system. Ultimately, the continued operation of this core network is critical for numerous stakeholders, including governments, communities, businesses, and individuals who rely on it. There are 370 existing coastal moorings within scope of the Strategy: intended for sustained operations and located within the U.S. Exclusive Economic Zone (EEZ). Of these, 90% are operated by NOAA and IOOS Regional Associations; 215 are operated by federal entities (NOAA and USACE) and 155 by nonfederal entities (IOOS Regional Associations and the NSF Ocean Observatories Initiative). The Strategy evaluates this existing inventory and provides 10 recommendations towards development of an implementation plan. The primary recommendation is identify regional observing gaps best addressed with coastal moorings, using a targeted stakeholder engagement approach to integrate stakeholder input. This effort will be led jointly by NOAA mooring operators and IOOS RAs. This regional stakeholder input will ensure that the network addresses real needs and utilizes available resources efficiently and effectively. The writing team, led by IOOS and NDBC, consisted of scientists from NWS; NOAA Research (GLERL); IOOS RAs (NANOOS, AOOS, NERACOOS), and academia (Scripps). The review process included input from a variety of federal and non-federal groups. The document will be presented by Joseph Pica (Director, NWS Office of Observations) at the American Meteorological Society Meeting in Seattle, Wash. on January 23 at 4 pm during the session “Novel Observational Techniques: Data Assimilation, Unmanned Observations, Regional Networks, and Coastal Data Needs -Part II.” Read the full Strategy here.